We’d been dying to go pearl diving in Tahiti ever since we saw it used as a challenge on an episode of The Amazing Race in early 2013. So we were excited to find out about the Bora Pearl Company, a Tahitian-owned family business located on the island of Bora Bora. Pearl farming in Tahiti originally began back in 1966. Photographer Erwin Christian and his wife Ate opened the island’s first pearl boutique 11 years later. Their daughter Tea’s interests in marine biology and jewelry design eventually led the family to create The Farm. It’s one of the only places in all of Tahiti where you can actually go pearl diving, find your own locally cultivated pearl, and take it home with you. When we arrived at The Farm, they gave us a tour of the facility, teaching us about how the Tahitian black pearls are grown. It starts with the introduction of a foreign substance– in this case a round piece of oyster shell harvested from the Mississippi River– into a black-lipped oyster. For some reason, this is the only pearl nucleus that these Tahitian oysters will accept. 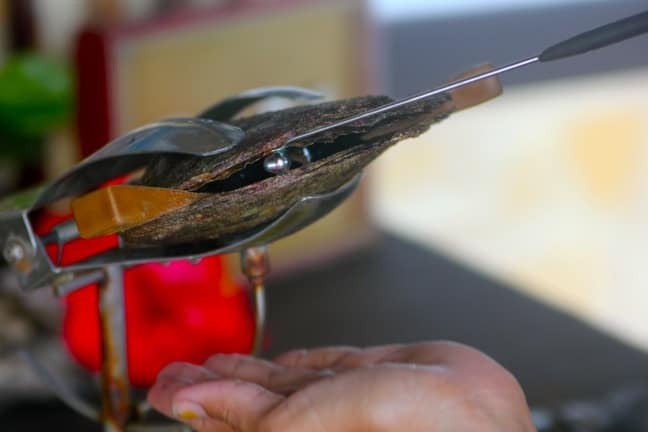 They explained to us each stage of the growth process, from the grafting and the birth of the pearl to the cultivation and harvesting process, a meticulous operation that takes two years. We learned that these Tahitian Black Pearls actually come in 5 different colors– blue, green, eggplant, peacock, and gold. The luster, or reflective quality of the pearl’s surface, is a key factor in determining its ultimate value. 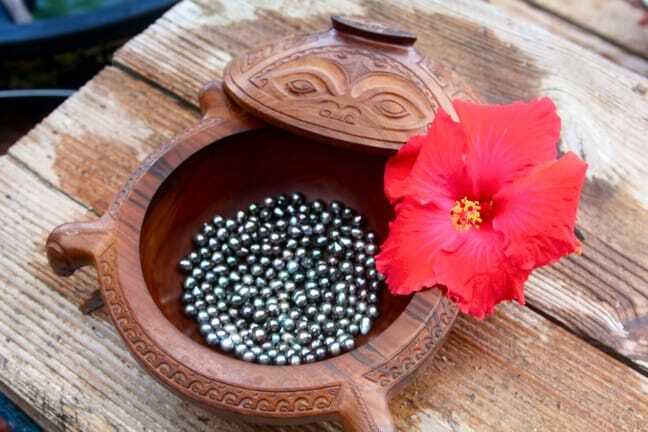 The French Polynesian Parliament regulation defined 4 basic qualities, based on the number of imperfections found on the surface of the pearl as well as the intensity of the luster. 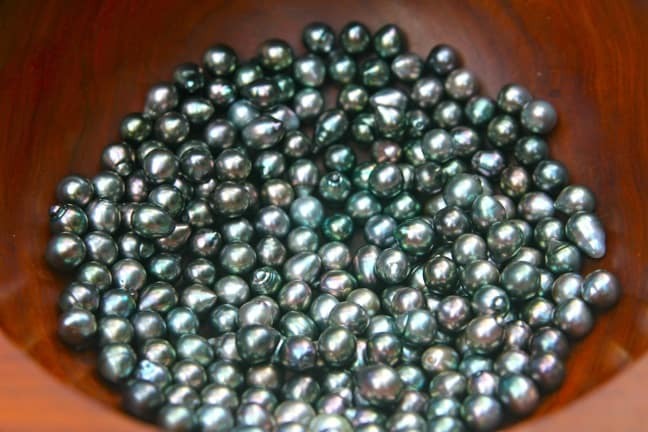 If a Tahitian pearl garners an “A” rating, that means it boasts imperfections on less than 10% of the pearl’s surface. After this brief education, it was time to go pearl diving. So we strapped on our masks and snorkels and swam out into a gorgeous blue lagoon just offshore, where we quickly saw several spotted rays and all sorts of tropical fish below. There were 4 farming sections spread out around the lagoon, each anchored by rope to a bottom we couldn’t see. Each section had around 22 lines attached, with 4-6 oysters per line. Guests dive down with a dive master to guide them, unhook one line, and then bring it to the surface to find out what’s inside. It sounds simple enough, but with the lines secured 10-15 feet below the surface, it took a really deep breath to get down there long enough to execute any action. It’s hard to imagine pearl diving back in the 19th and early 20th century, when guys had to free dive 40-100 feet to harvest oysters. 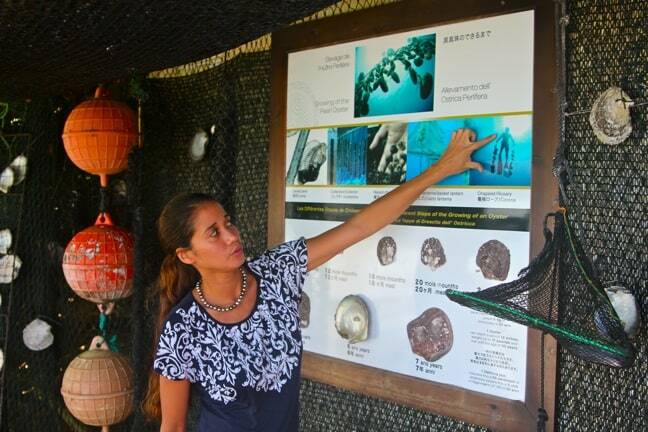 Back at the shop, our guides showed us the process of harvesting the pearls. After clamping the oyster delicately into a vice, they pry the bivalve open just enough so they can fish around inside it to find the precious gem. They do this very gently, because a good oyster can keep creating pearls for around seven years! After a few seconds, she managed to locate the pearl within, and carefully pulled it out for us. The Pearl Diving experience is a little pricy (around $300), but the Bora Pearl Company guarantees that you’ll go home with a pearl at least that valuable. If the pearl you find isn’t worth as much, they replace it with one that is. And if yours is a perfect gem, it could be worth $2000 or more. Luckily, it turned out our little pearl was a keeper. Tahitian pearls come in myriad shapes and sizes, typically ranging from 9 to 12 mm and from perfect circles to drops, baroques, and ringed pearls. The larger the size and the more perfectly round the shape, the more valuable your pearl will be. Once you’ve found your pearl, the jewelers take it back into the shop to drill a hole for stringing, so you can then have it put onto a necklace or bracelet. For an inexpensive souvenir, you can also have them engrave a Tahitian design into an unproductive oyster shell: We had them do a sea turtle for my daughter. 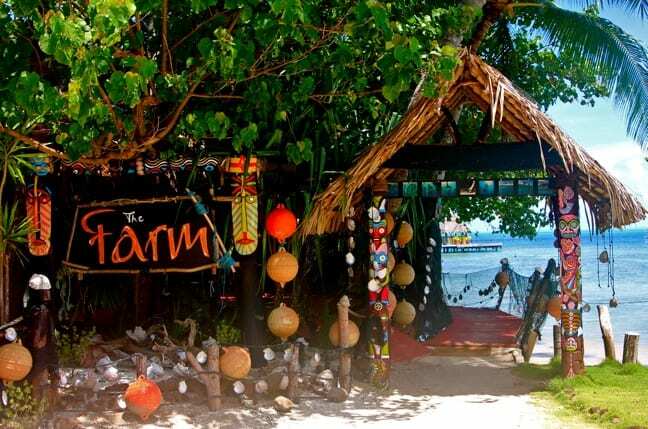 This family-owned pearl farm/boutique is an incredible tourist attraction unlike anything else you’ll find in Bora Bora.